Family had visited for a long weekend and suggested a trip to the Kennedy Space Center Visitor Complex. Sounded like a great idea. It sounded like a great idea. After all, it had been years since we were all there together. So I’m at the Space Shuttle Atlantis exhibit. I know perfectly well I’m being manipulated. It’s a theatrical experience, after all and I’m a hardened theater critic. I recognize it’s filled with heroic music, spectacle and storyline with the U.S. manned space program as hero. I’ve been through this before, so I know what to expect. But still, I stand there, the “big reveal” about to happen and I cry like a baby. I wonder if I’d do that without those swelling violins raising my emotions. I’m not alone. Visitor Complex marketing director Andrea Farmer has gone through this tons of times and still tears up. I know because I’ve seen her do it. For sure, it’s an exhilarating experience made so thanks to the theatrical manner in which it is presented. There is the exposition, the rising action, the climax and denouement. Even a touch of conflict in the storyline when engineers talk about schedule set backs. But it’s just so darned satisfying. So comfortable. We slip into our “good guy” skins and and feel positive and bright about what we’ve done as Americans. Given today’s headlines, that’s a very nice sweet spot to be. For a link to a video about the exhibit, click here. And we had a great time. We learned tons. Engaged in mining activities on asteroids and comets, returning to Earth in a blink of an eye thanks to some kind of plasma drive. We docked Orion with the International Space Station. And then we had a late lunch and strolled the Rocket Garden then took a 3-D “Journey to Space” at the IMAX Theater. If you’ve put this far too long on your back burner, it’s time to turn up the heat before Mother Nature does. Just be sure to wear comfortable shoes…and bring along some Kleenex. Here’s visitor information copied from the Visitor Complex’s press release: Kennedy Space Center Visitor Complex opens daily at 9 a.m. with closing times varying by season. Admission is $50 + tax for adults and $40 + tax for children ages 3-11. The Kennedy Space Center Visitor Complex offers annual passes starting at $75 + tax for adults and $60 + tax for children ages 3-11. 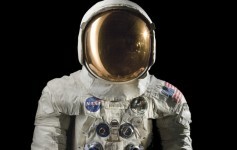 Admission also includes the U.S. Astronaut Hall of Fame. For more information, call 877-313-2610 or visit www.KennedySpaceCenter.com.For more information, call 877-313-2610 or visit www.KennedySpaceCenter.com.